in-ceiling speaker below $1000. This is a huge achievement and well deserved recognition for this excellent product. The A-BUS Direct Active Speaker, manufactured by Leisuretech Electronics and branded and distributed by Eaton in the US, is available under the Forté brand in Australia from Leisuretech Electronics. You can click here to view the award on the CEPro website or read the summary below. 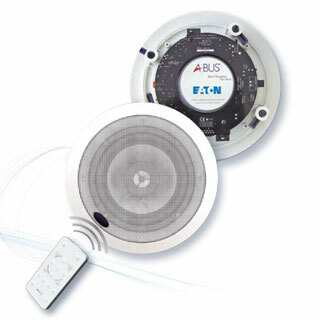 Eatons A-BUS Direct speakers could be best described as audio made easy! Adding additional speakers to an already existing A-BUS system only requires a single CAT5 cable run directly to the speaker location. This new design not only eliminates the need to fish wire to a volume control location on the wall, but it also cuts down on the amount of speaker cable needed. The volume control and amplifier are now built directly into the speaker. Placing the amplifier at the speaker location ensures a proper match of power to the speaker and eliminates cable/signal loss.  The A-BUS amplifier is matched to the speakers allowing for better sound quality. and include your company name.